The chief mate of the Pequod was Starbuck, a native of Nantucket, and a Quaker by descent. He was a long, earnest man, and though born on an icy coast, seemed well adapted to endure hot latitudes, his flesh being hard as twice-baked biscuit. Transported to the Indies, his live blood would not spoil like bottled ale. He must have been born in some time of general drought and famine, or upon one of those fast days for which his state is famous. Only some thirty and summers had he seen; those summers had dried up all his physical superfluousness. But this, his thinness, so to speak, seemed no more the token of wasting anxieties and cares, than it seemed the indication of any bodily blight. It was merely the condensation of the man. He was by no means ill-looking; quite the contrary. His pure tight skin was an excellent fit; and closely wrapped up in it, and embalmed with inner health and strength, like a revivified Egyptian, this Starbuck seemed prepared to endure for long ages to come, and to endure always, as now; for be it Polar snow or torrid sun, like a patent chronometer, his interior vitality was warranted to do well in all climates. Looking into his eves, you seemed to see there the yet lingering images of those thousand-fold perils he had calmly confronted through life. A staid, steadfast man, whose life for the most part was a telling pantomime of action, and not a tame chapter of sounds. Yet, for all his hardy sobriety and fortitude, there were certain qualities in him which at times affected, and in some cases seemed well nigh to overbalance all the rest. Uncommonly conscientious for a seaman, and endued with a deep natural reverence, the wild watery loneliness of his life did therefore strongly incline him to superstition; but to that sort of superstition, which in some organization seems rather to spring, somehow, from intelligence than from ignorance. Outward portents and inward presentiments were his. And if at times these things bent the welded iron of his soul, much more did his far-away domestic memories of his young Cape wife and child, tend to bend him still more from the original ruggedness of his nature, and open him still further to those latent influences which, in some honest-hearted men, restrain the gush of dare-devil daring, so often evinced by others in the more perilous vicissitudes of the fishery. 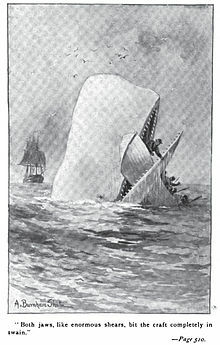 "I will have no man in my boat," said Starbuck, "who is not afraid of a whale." By this, he seemed to mean, not only that the most reliable and useful courage was that which arises from the fair estimation of the encountered peril, but that an utterly fearless man is a far more dangerous comrade than a coward. With memories like these in him, and, moreover, given to a certain superstitiousness, as has been said; the courage of this Starbuck, which could, nevertheless, still flourish, must indeed have been extreme. But it was not in reasonable nature that a man so organized, and with such terrible experiences and remembrances as he had; it was not in nature that these things should fail in latently engendering an element in him, which, under suitable circumstances, would break out from its confinement, and burn all his courage up. And brave as he might be, it was that sort of bravery chiefly, visible in some intrepid men, which, while generally abiding firm in the conflict with seas, or winds, or whales, or any of the ordinary irrational horrors of the world, yet cannot withstand those more terrific, because more spiritual terrors, which sometimes menace you from the concentrating brow of an enraged and mighty man. But were the coming narrative to reveal in any instance, the complete abasement of poor Starbuck's fortitude, scarce might I have the heart to write it; but it is a thing most sorrowful, nay shocking, to expose the fall of valor in the soul. Men may seem detestable as joint stock-companies and nations; knaves, fools, and murderers there may be; men may have mean and meagre faces; but, man, in the ideal, is so noble and so sparkling, such a grand and glowing creature, that over any ignominious blemish in him all his fellows should run to throw their costliest robes. That immaculate manliness we feel within ourselves, so far within us, that it remains intact though all the outer character seem gone; bleeds with keenest anguish at the undraped spectacle of a valor-ruined man. Nor can piety itself, at such a shameful sight, completely stifle her upbraidings against the permitting stars. But this august dignity I treat of, is not the dignity of kings and robes, but that abounding dignity which has no robed investiture. Thou shalt see it shining in the arm that wields a pick or drives a spike; that democratic dignity which, on all hands, radiates without end from God; Himself! The great God absolute! The centre and circumference of all democracy! His omnipresence, our divine equality! If, then, to meanest mariners, and renegades and castaways, I shall hereafter ascribe high qualities, though dark; weave around them tragic graces; if even the most mournful, perchance the most abased, among them all, shall at times lift himself to the exalted mounts; if I shall touch that workman's arm with some ethereal light; if I shall spread a rainbow over his disastrous set of sun; then against all mortal critics bear me out in it, thou just Spirit of Equality, which hast spread one royal mantle of humanity over all my kind! Bear me out in it, thou great democratic God! who didst not refuse to the swart convict, Bunyan, the pale, poetic pearl; Thou who didst clothe with doubly hammered leaves of finest gold, the stumped and paupered arm of old Cervantes; Thou who didst pick up Andrew Jackson from the pebbles; who didst hurl him upon a war-horse; who didst thunder him higher than a throne! Thou who, in all Thy mighty, earthly marchings, ever cullest Thy selectest champions from the kingly commoners; bear me out in it, O God!